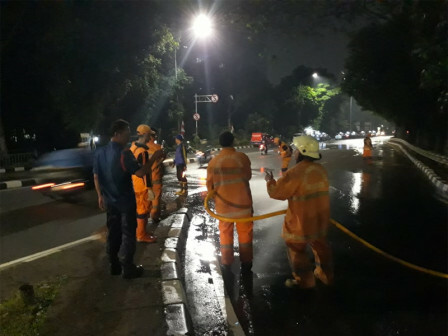 "Last night we cleaned the torch relay route, Jalan Trakindo KKO"
South Jakarta Fire and Rescue Sub-dept., cleaned Jalan Trakindo KKO that will be used for torch relay last night. Ruwanto, Head of Pasar Minggu Sub-district Sector IX Group C said that cleaning was conducted to succeed the forthcoming Asian Games. "Last night we cleaned the torch relay route, Jalan Trakindo KKO," he expressed, Tuesday (8/14). He explained that it was focused on two roads such as Post 14 along Jalan Cilandak KKO, precisely in front of Jannatin Mosque, RW 05 until Bapra Building and Post 16 along Jalan Cilandak KKO, precisely in front of Trakindo until the round of the area. Two pump units were sent to the location. One of them was from Ragunan GOR's PPOP Post with 1,500 liters capacity and the other one was from Pejaten Barat Post with 4,500 liters capacity. "We send 14 officers to the field. It is conducted at night to avoid traff ic jam," he said.